I've been watching a mad video on Youtube about Running on Water. The Video was created by Hi-Tec, and runs under the guise of Liquid Mountaineering, a new sport which is attempting to achieve what man has tried to do for centuries: walk on water. Or to be more precise: running on water. the concept being that with the right water repellent equipment you can run across bodies of water, just like a stone skimming the surface. The shoes in question are the new Hi Tec V-Lite Infinity, being launched shortly in the UK, and being Hi-Tec's return into the serious footwear market, by producing the ultimate lightweight adventure performance shoe, creating a running shoe that could cope with everything while being comfortable and grippy enough for all conditions. But most importantly that it could remain incredibly lightweight without soaking up water on the fells. 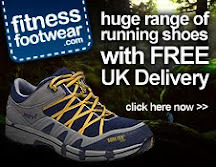 Having seen the shoe advertised on the Hi-Tec Sports site and having run in Hi-Tec shoes years ago, I cant wait to get my hands on a pair and see how they have improved to become serious contenders in the trail running market, with some stunning looking shoes, that will make wet feet in winter a lot harder to find. Interesting. Looks like the guy doesn't need to wear socks with them.